In a poll conducted mid-week last week, Public Policy Polling has Colorado's Amendment 64 marijuana legalization initiative winning, with 53% of respondents saying they would vote for it. Only 43% were opposed, with 5% still undecided. The number is up slightly from recent polls, one of which had the measure leading by a margin of 48% to 43%. The second recent poll had the measure at 50%, with 40% opposed. What had begun to appear as shrinking support among women voters in those two recent polls appears to have reversed in this latest poll. It has women supporting Amendment 64 by a margin of 50% to 46%. 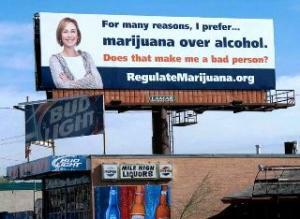 The Campaign to Regulate Marijuana Like Alcohol is pulling out the stops as Election Day draws near. The well-funded campaign is running two TV advertisements and a radio ad featuring single Melissa Etheridge. It also had actress Susan Sarandon doing robo-calls to still-undecided voters. But the campaign is taking nothing for granted, and it is asking supporters around the country to go to the phone banking website set up by Firedog Lake and make calls to the as yet uncommitted. In such a tight race, every potential "yes" vote counts. The Public Policy Polling survey contacted 904 likely voters. The margin of error is +/- 3.3%. Awesome I really hope this passes in the important swing state of Colorado, and I'm not even American. The Americans started prohibition and persuaded the rest of the world to go along with it. Prohibition is now international law, but if the US federal government allows states to legalise then why should the rest of the world continue to go along with it and honour their international agreements when the country that started it won't honour their commitment to prohibition. Think how a Mexican might see this, they might be thinking something like "why the hell should we continue to suffer in a pointless drug war just to honour our international agreement to prohibit the stuff when the country consuming the stuff won't stick the their part of the bargin to prohibit it?" One day I think this heap of crap called cannabis prohibition will collapse like a house of cards. But the real problem is that politicians thought it was popular so they built their careers on supporting it - now they don't want to back down in case they risk losing face. It was a crime and based on lies when they made the most useful plant on the planet illegal. Food, clothing, shelter, energy, medicine, insight. By every objective measure, marijuana is far safer than alcohol, so why should the purchase and home production of marijuana be *more* restricted than alcohol? Paranoid old men in the federal government keep marijuana illegal and make your children LESS safe!